Lime nails look strikingly delightful and pretty. The color green, in general, looks so vibrant and friendly, so keep that in mind when getting manicured the next time. Did you know that your nails grow a lot longer and faster in the summer than in the winter? So, this summer, you will be one lucky lady with natural, long, and colorful nails. You will see that sticking with just one design is pretty much impossible. Before jumping straight into this manicure make sure you have healthy nails and the proper green polishes right next to you. One thing is for sure, you will have the prettiest beachy nails. Kill them with kindness and with style. This totally stylish and perfect for clubbing neon nail manicure should be worn by our party women. They are very long, so make sure not to break them when ordering a drink or fearlessly dancing at a club. This short lime green nail design is perfect for women who do a lot of work. And not just work at the office, but also at home, since longer nails tend to break easier. You will feel a deep relief after doing the dishes and having all ten of your nails untouched. Short, natural nails are also appreciated a lot more by men, so you are in good luck if you are seeking for their approval. These perfect for prom nails are fabulous. If you prefer shorter nails but with a little bit of attitude, just get these. Even though they are short, these green nails with silver shimmer and sparkle will not go unrecognized, trust me. If you felt blue and you’ve had a bad day, these lime green nail designs are here to cheer you up. They have some tribal moments with a hint of elegance, so that’s a plus for multipurpose. You can dress them up or down depending on your mood, go out in the wild, and have fun. Little polka dots are a crazy and funky accessory to the nails. These asymmetrical and interesting shapes are also giving an extra funkiness to the whole picture. Ombre is an endless trend that many ladies love. These square nails that transition from a green into yellow shade should be your go-to nails when the summer starts. They are so vibrant and just perfect for those hot summer days. Get this manicure with your favorite neon lime green nail polish brand. Watermelon anyone? The ultimate summer fruit should be paired up with the ultimate summer nails. Cute lime green nail design with a glimpse of pink color is our favorite so far. These nails will also give you an instant refreshment. Looks like someone is ready for a date. Fancy dinner is what’s next on my schedule if I get this manicure. Very long shimmery nails with added stones, these nails will definitely get you off the hook for the bill and add that extra glee you need. Some real professional did a great job with these. The cheetah print looks fierce and frisky, while the lighter color tones it down a bit, so the nails don’t look too aggressive. They are just in the middle between being your stylish everyday wear, or your night out option. Can you handle these lime green coffin nail designs? The creations are off the chart and so original. Especially when we get to this lucky number 10. The ring fingernails are mad looking and totally spice up the whole design. The stiletto shape also makes them look sexier than you’d think. Spring has sprung a long time ago, but with these nails, we feel like it’s the spring season yet again. Little flower print reminds us of the Orchid’s, which is a flower that every woman likes. Have the most original nails and get this lime green nail design before anyone else. Hi, my fancy little princesses. These nails are screaming your name and waiting for you to slay them for your prom. Don’t be afraid to be different and to stand out in the crowd with these, because that’s what beauty is all about. These lime green manicures are such a catch. Happy colors with loads of criss-cross lines give out that childish vibe and we love it. How about you take me out on a second date? This is the ultimate nail combo for your date night out. You will leave your man speechless because you will have style, sass, and uniqueness. Do you know that fingernails grow an average of 3.5 millimeters per month? Try wearing them all natural with this cute green color and attract looks wherever you go. If you are artsy and acrylic is what you love to rock, this manicure is for you. Very long, very detailed out, and very pretty, these lime green nail designs will make every woman around you jealous. They might even ask for your nail technicians number, so be ready to give out some information. 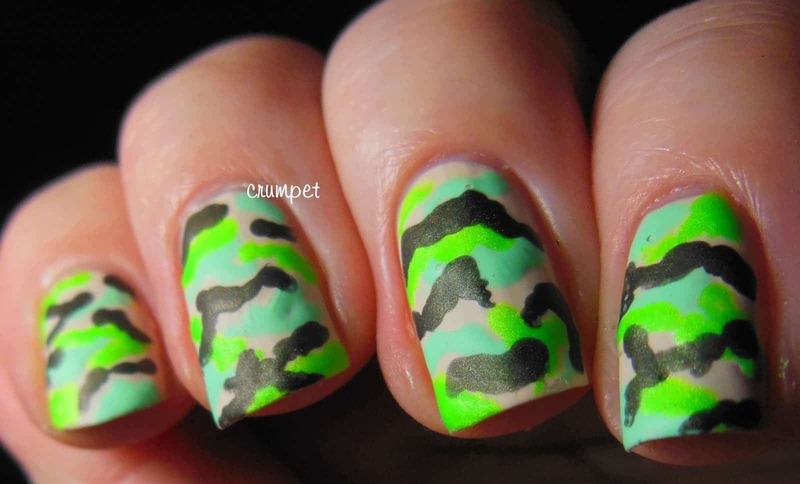 Army inspired or camouflage nails are something that you don’t see every day. If you are not feeling too feminine and would like to spice up your nails go for the camo option. A little miracle has found a way onto our nails. These light ombre nails look perfect for summer. They look juicy and like they’ve been washed out by rain. Artful is the best word to describe this lime green nail design. We did not mean to spook you with these nails, but we do believe that they are perfect for Halloween. The light green nail polish base with the black dripping effect looks mysterious and fun at the same time. Don’t these look juicy or what? They remind us of a cocktail or a nice, healthy, delicious smoothie. The beverage that you will be drinking the most by the pool in the upcoming months. If you’ve already fallen in love, we feel you. If you can’t make up your mind, we feel you. And if you haven’t found anything that appeals to you, we don’t feel you. We do believe that there is something for each and every one of you ladies and that at least one of these nail designs is your cup of tea.